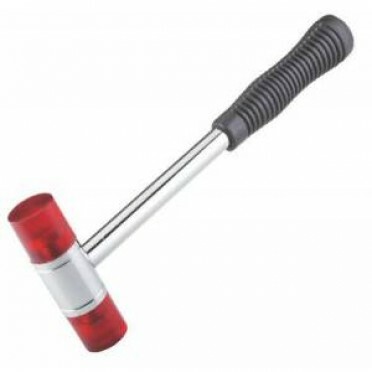 A mallet is a kind of hammer, often made of rubber or sometimes wood, that is smaller than a maul or beetle, and usually has a relatively large head. The term is descriptive of the overall size and proportions of the tool, and not the materials it may be made of, though most mallets have striking faces that are softer than steel. Features & Specifications :Partially Hardened up to 55 - 58 HRC on Striking surfaces needed as f.. Features :Partially Hardened up to 55-58 HRC on Striking surfaces needed as functional require.. Features :Only available in ball penHead drop forged made from high grade steel.Head deferentially h.. Features :Drop forged from high-grade carbon steel.Partially hardened up to 46 - 58 HRC on striking .. Features :Compact in size, this tool will make the task of fixing your fence easier. This 13 mm dril.. Description :The drill from Skil has a power rating of 450 Watts. It has a no-load speed of 3000 rot.. Description :An angle grinder is one of the most important tools needed for metal body work. If you .. Description :This Skil air blower is efficient. Powered by a 600W motor, the air blower is capable o..